Shirts With Random Triangles: South Carolina Gets Letter Of Intent From Three-Star WR Korey Banks. Banks had previously been committed to North Carolina, but announced that he had decommitted from the Tar Heels on Monday. 247Sports grades Banks as a composite three-star wide receiver prospect The recruiting website ranks Banks at no. 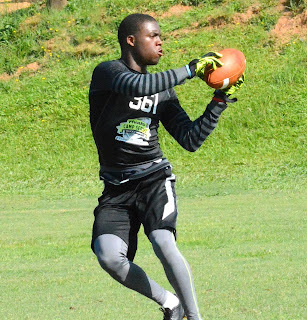 119 among 2016 WR prospects, at no. 74 among 2016 prospects from the state of Georgia, and at no. 789 in its composite rankings of 2016 prospects nationally. Banks attends Sandy Creek High School in Tyrone, GA. He stands 6'0, and weighs 170 lbs. At the time this article was written, South Carolina's 2016 recruiting class currently has six early enrollees, seven players who have signed their letter of intent, and 11 commitments.